Thank you for you interest in MGK® products. To learn more about our products and services, or to submit questions, comments or concerns, please fill out the form below. An MGK representative will respond. US & Canada Only. 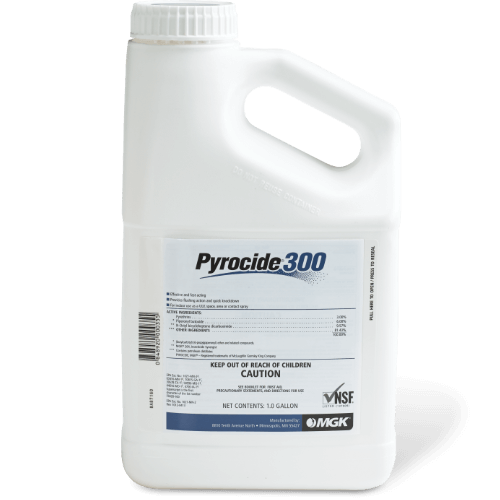 We'll use this to direct you to the most appropriate sales rep.
Pyrocide 300 Fogging Concentrate is a dual-synergized fogging concentrate that provides flushing and fast knockdown of a broad spectrum of commercial and residential pests, including cockroaches, stored product pests, flies, spiders, ants, fleas and ticks. Reference the product label for the full list of pests killed or controlled. Pyrocide 300 is dual synergized for enhanced control. What package sizes are available for Pyrocide 300? Please contact your distributor for availability.